Lucca Cafe Goblets & Pitcher (P/N 15593). 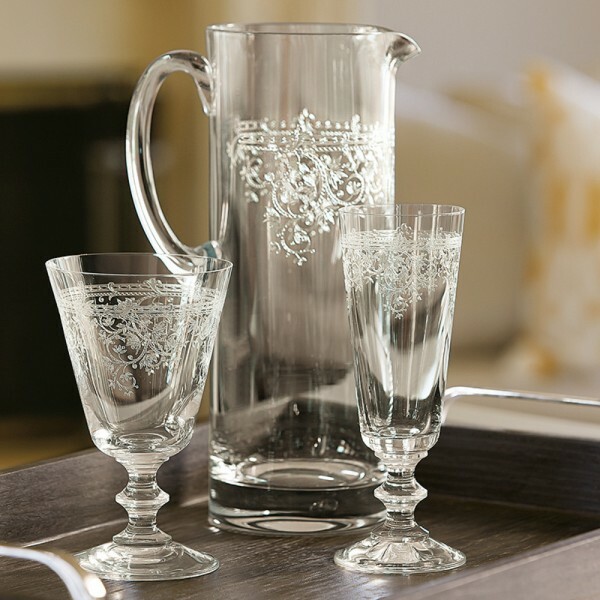 This stunning etched pitcher and goblet set is hand-made from lead free crystal and features a scroll motif for an impossibly beautiful, elegant finish. The pitcher measures approximately 10 inches high by 6.5 inches wide, including the handle. The pitcher holds approximately 44 oz. Each glass is machine-made from lead-free glass, and measures approximately 6 inches high by 3 inches wide. Each glass holds approximately 8 oz. Set includes 6 glasses. Matching Cafe glasses, as well as stemmed wine glasses, also available.